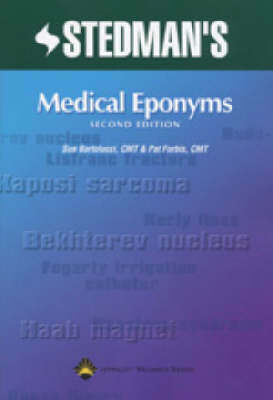 Stedman's Medical Eponyms, Second Edition has been fully updated and revised to include the wealth of eponymous terms encountered in medicine. Medical language professionals, medical transcriptionists, and students will find this new edition to be a comprehensive resource, with clear, concise definitions for each term along with accurate spellings. The A-Z section lists names alphabetically, with the related eponymous terms and definitions provided as subentries. New additions users will find in this revised edition include Alder-Reilly anomaly, Lenz-Majewski syndrome, Ramirez EndoForehead™ dissector, and more! Stedman's Medical Eponyms, Second Edition is also available on CD-ROM.